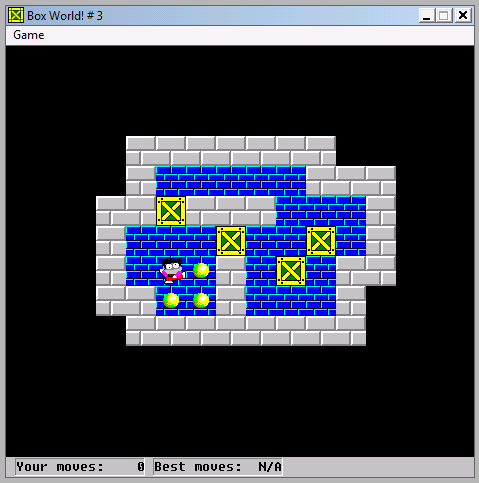 Boxworld is a classic among Sokoban programs. Probably mostly because of the skin. Programed by Jeng-Long Jiang and released in 1992 (1991?) for Windows 3.1. Boxworld was freeware. 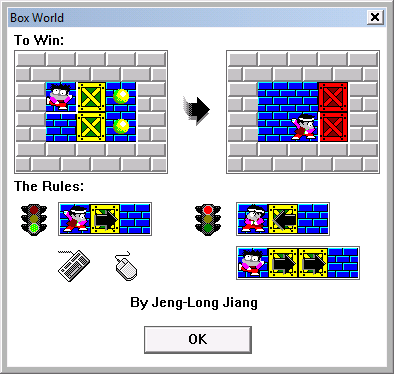 If you have a 32-bit Windows computer, meaning many Windows7 installations and most older Windows installations, you can still play the original Boxworld. If not, you can play Boxworld with a few modifications if you have an Android device. Boxworld was released for this platform 2012. Finally Boxworld implementations are widely found online. Boxworld contains 100 puzzles. None original. All borrowed from Sokoban Perfect and Sokoban Revenge. Arguably the most interesting about Boxworld is the skin. The graphics are very clear and the lay out of the walls, blocks and goal are very easy to read. But the graphics do not look good playing Sokoban on a high resolution screen. For that reason I remade the skin some years ago with 60×60 pixel blocks, a double of the originals 30×30, and some editing of the graphics. And added graphics for Sokoban on Goal. The original does not contain that. And lately, with help from Brian Damgaard, added animation for the skin in 2 variations. The graphics and animations could surely be done better by a professional but anyway I think you will be pleased with the results shown below. icon-file-o Boxworld v1.1. Download, unzip and play. 32bit Windows pc’s and MacIntosh. icon-external-link Boxworld Origins for Android. icon-external-link Boxworld Online. By Michel Buze. The Java code is supplied. icon-external-link Boxworld Online. By Matthias Selle. With solutions. I love those sick eyes on goal! Why didn’t I get that idea?